Hotels Used The Auspicious Hotel o Hotels Used D’Zojila Residency o Hotels Used Hotel York o Hotels Used Royal Park o Hotels Used Hotel Baisaran o Star Category3 Star o Room Type Comfort Room o Meals Included Breakfast, Dinner3 Nights stay at hotel in Leh with all meals.1 night stay at Hotel in Kargil with all meals.2 nights stay in Srinagar at Hotel with breakfast and dinner.1 night stay in Gulmarg at Hotel with breakfast and dinner.1 night stay in Pahalgam at Hotel with breakfast and dinner.Airport hotel transfer in Leh.Tour of Hemis and Thicksey Monastery.City tour of Leh visiting Sangkar, Shanti Stupa and Leh Palace.Tour of Khardung la.Vehicle for Leh to Srinagar transfer via Kargil.Hotel - airport transfer in Srinagar.Half day tour of Mughal Gardens.Full day tour of Gulmarg.All applicable taxes. Note: Meal Plan may differ from the above at certain hotels. Please check in the tour program for the meal plan offered with the name of the hotel. Arrive Leh - day free to relax and acclimatize On your arrival at Leh airport our representative will meet & greet and transfer you to the Hotel. Welcome drink on arrival and check in to the hotel. We recommend you completely relax for the rest of the day to enable your body to acclimatize to the rarefied air at the high altitude. 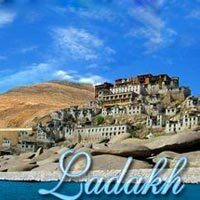 Leh is situated at the height of 11563 feet. Lunch and dinner is served at the hotel. Spend overnight at the hotel. Leh - Monastery tour Breakfast at the hotel. After breakfast we take you for a full day tour of Monasteries. We first visit Hemis Monastery which is one of the biggest and best known monastery in this region. Then we visit Thicksey Monastery located at a distance of 18 kms from Leh town. Then we visit Shey Palace. Then we visit Rancho School of 3 Idiot’s fame. The we return to hotel en route visiting Sindhu Point. Lunch at the hotel. After lunch time free to visit the local markets. Dinner is served at the hotel. Spend overnight at the hotel. Leh - Khardung la Breakfast at the hotel. After breakfast drive to Khardung la which is 43 Kms from Leh. Today it is the unique opportunity to drive on the highest motor-able road in the world at 18380 feet. The views from the top of the pass are amazing. This road carries on to the Nubra Valley. Return to the hotel for hot lunch. After lunch take a tour of Leh city visiting Sangkar, Shanti Stupa and Leh Palace. Dinner is served at the hotel. Spend overnight at the hotel. Leh - Kargil After breakfast leave for Kargil. On arrival in Kargil check-in at the hotel. Rest of the day free to walk around the small town of Kargil. Dinner and overnight at the hotel. Kargil - Srinagar via Sonmarg Early breakfast at the hotel. After breakfast drive to Srinagar. En-route stop at Sonmarg - You may take a pony ride (at your own cost) to Thajiwas Glacier where snow remains round the year. On your arrival at Srinagar, check in at the Hotel. Dinner and overnight in the hotel. Srinagar - Half day tour of Mughal gardens Breakfast at the hotel. In the afternoon we take you for a tour of Mughal Gardens. Chashmi-e Shahi - The Royal Spring which commands a magnificent view of Dal Lake; Nishat Bagh - The Garden of pleasure is located on the bank of Dal Lake with Zabarwan Mountains in the back & Shalimar Bagh - Abode of Love which was built by Emperor Shah Jehan for his wife Nur Jehan. Your overnight stay is at hotel in Srinagar. Srinagar to Gulmarg Breakfast at your hotel. After breakfast check out and drive to Gulmarg which is at a distance of 56 Kms and 2 hours drive from Srinagar. On arrival in Gulmarg check in at hotel. Gulmarg - Meadow of Flowers. Gulmarg is a popular hill station and well known for skiing in winters. Gondola ride in Gulmarg is a must for all tourists. There are 2 phases of Gondola. The first phase takes you from Gulmarg to Kungdoor. The second phase takes you from Kungdoor to Aparwath. The tickets can be booked in advance on http://www.gulmarggondola.com. Spend overnight at your hotel in Gulmarg.